It was an uneventful week. As always, I had hoped to get much more done. Next week should be better! A few lessons arrived but not many. I think midwinter blues have set in! My New Year's Resolution several years ago was to review lessons the day they arrive. So far, so good. Maris, a former student, had a suggestion for me and it is a good one. She thought a video on how to weave in yarn tails in stranded work would be useful. Weaving in yarn tails is sort of my thing (check the index of tips for proof!) To review, it really doesn't matter which technique you use as long as 1) the tail doesn't show through to the front even when the piece is stretched 2) it doesn't change the elasticity of the piece 3) it doesn't pull through to the front when stretched. The technique I've found meets all of these criteria is the duplicate stitch for stockinette. Since most stranded work is done in stockinette, this would be my choice but the strands can make the stitches hard to see. What I generally do is work a few duplicate stitches to anchor the tail and then I run it through one of the strands itself. In the photo below I have an arrow pointing to the strand. I used a sharpish needle to run the tail through the plies. In this particular stranded design 6 rows are worked without stranding. When I weave in the tails at the top of the design I can use the duplicate stitch method as shown in this photograph. When you are weaving in the tails you have to look at the location for each and determine the best approach. When I am weaving in tails in stranded work, I cut each tail as I weave it in. I learned this lesson the hard way, I cut a tail before I had woven it in and had to repair that part of the sock. NOT FUN! Salon will be on Sunday from 2-4pm. The Met HD production is Tales of Hoffman, one of my favorites. I haven't been able to go to many this year so I don't want to miss this one on Saturday. I have finally finished up the socks for the Confident Beginner series. I will be working on the patterns this weekend. I've finished the second sock as well but it is soaking in a bowl of water right now. Here is the first one. All of these socks were knit using Neighborhood Fibers. 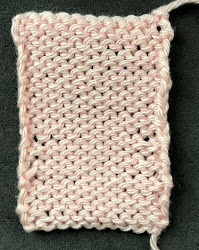 Although this pinkish yarn may look identical to the yarn I used for the sock above, it isn't. It is Madelinetosh Sock yarn. The contrast color may look purple but it is actually black. These are for a birthday gift. I decided to use my Rick Rack pattern as I wanted to do the video on stranding. Very self serving!